Today’s post is an update on the SmallCap Growth AIM Portfolio, which has now reached the eighteen month mark. The SmallCap Growth AIM Portfolio (SGAP for short) was originally a 20-30 stock portfolio started in March 2015 with £15K in an ISA. The current target capital for the portfolio is £50K (not yet fully allocated). We could have up to 50 positions now that the portfolio is larger. Conviction buys are currently £2K in size. Tentative positions are currently £1K. 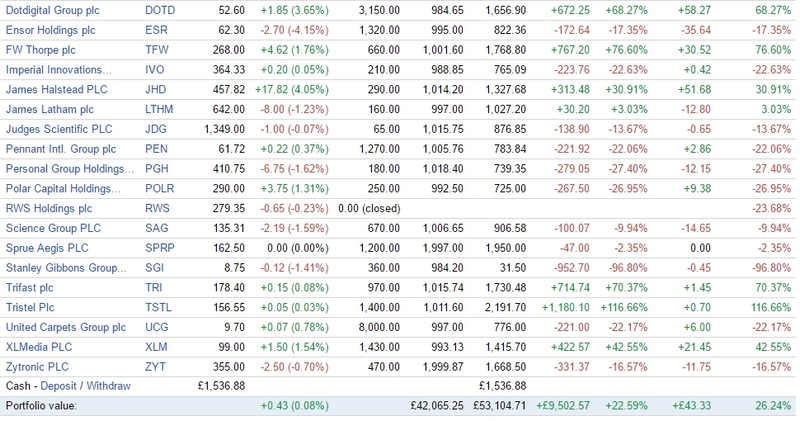 The plan is to grow the portfolio to £100K, with position sizes of £4K and £2K, still with a maximum of 50 positions. The target date for this was April 2017, but having effectively taken the summer off, this may be delayed by a few months now. 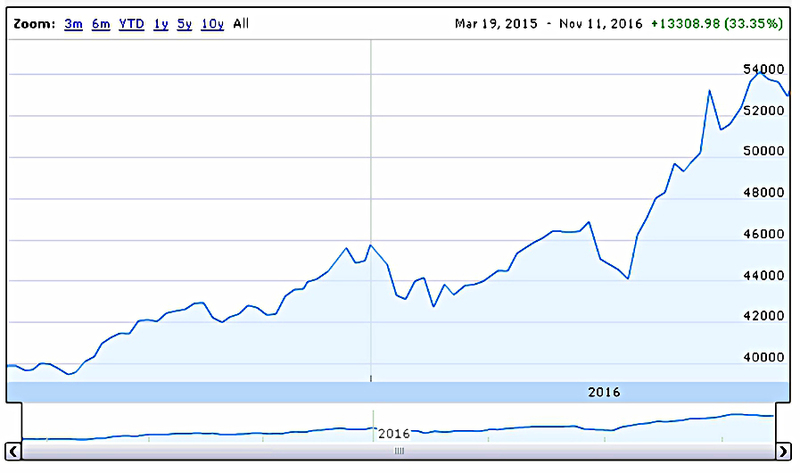 We last looked at the SGAP in April 2016. In the interim we have had two large macro “shocks” in terms of the Brexit vote and the recent election of Donald Trump as US president. During this period we’ve been largely sitting on the sidelines, not actively trading our portfolios. Although the full effects of these two votes won’t be known for several years, it’s time to get back on the horse. When we last looked at the SGAP, it held 31 stocks, and the initial investment of £33K had risen to £39K, a gain of 17.6% in just over a year. During the same period, the FTSE All-Share index (ASX) was down by 7.8%, putting the SGAP 25.5% ahead. The AIM All-Share (AXX) was up 1.9%, putting the SGAP 15.7% ahead. The SGAP was returning 17.0% annually. The AXX was returning 1.3% (SGAP outperformance of 15.8%). The ASX Total Return was -2.4% (SGAP outperformance of 19.5%). The AXX Total Return was 2.7% (SGAP outperformance of 14.3%). So that’s net buying of almost £7K, taking our net investments to £40K. We now have 36 holdings. No doubt you can spot the minor theme of buying after a profit warning – I wanted to see whether the “catch a falling knife” strategy could be successful with smaller stocks. I’m not a fan of this approach with large stocks, but in my limited experience, AIM stocks are more volatile and seem to overshoot more in each direction. 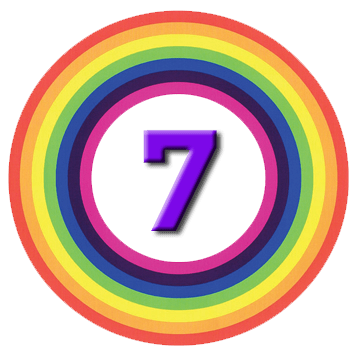 Buying several stocks this way (there were plenty to choose from – there were many profit warnings over the summer) would help me to see any pattern. I’ll report on progress across both markets at a later date, but things are not looking good. 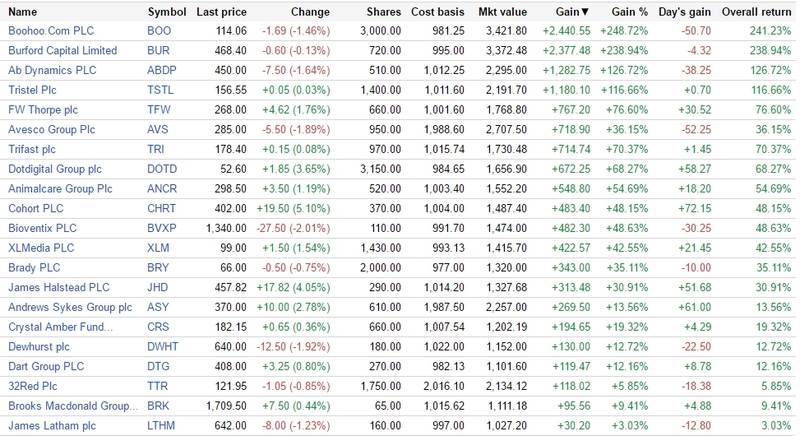 Here’s the portfolio again, this time ranked in order of gains (£££, not percentage). Note that we have 15 losers out of 36, despite the portfolio performing well overall. Eight of these losers are down more than 20%, and might have been sold had we been monitoring the portfolio closely over the summer. The big winners have been BOO (which is up around £5K including the tranche of shares already sold), BUR, ABDB and TSTL – all four are up more than £1K. The big losers (down more than £500) are CRAW, CNKS, and SGI. 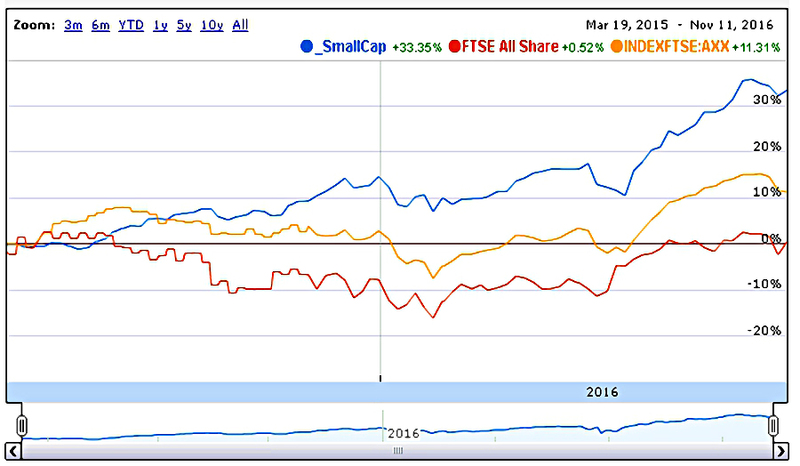 The FTSE All-Share is up just 0.5%, so we’re 32.9% ahead (an increase of 7.4% since April). The AIM-All-Share is up 11.3% so we’re 22.1% ahead (an increase of 6.4% since April). So it’s been another good six months, and a good eighteen months overall. The SGAP annualised gain is up from 17.0% to 22.5%. All remains well with the SmallCap Growth (AIM) Portfolio, despite my continued neglect. Next week we’ll catch up with another of the portfolios we’ve neglected over the summer.